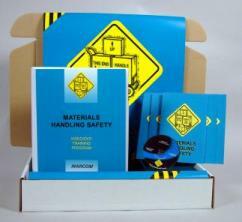 MARCOM's "Materials Handling Safety" Safety Meeting Kit™ provides the information employees need to work safely when handling various types of materials. Many employees feel that moving and handling materials that they work with every day is an "ordinary" task, not something that they really need to be concerned about. Yet there are hundreds of thousands of "materials handling" accidents every year... from small splinters, cuts or scrapes... to crushed fingers, hands and feet... even deaths. Materials in the kit include a video program, five motivational posters, and 30 employee booklets. The posters in the kit remind employees of the hazards that they face when handling and moving various types of materials. The videotape and employee booklets include information on types of potential hazards, planning a job, personal protective equipment, proper lifting and moving techniques, other ergonomic considerations, hand trucks, carts and pallet trucks, mechanical lifting devices, and more. The video program in the kit comes with a comprehensive leader's guide, reproducible scheduling & attendance form, employee quiz, training certificate and training log.